Most people call these Peanut Butter Blossoms and they are Very Very good. These are my favourite peanut butter cookies and I’ve tried 13 different peanut butter cookie recipes. There are many different kinds of Hershey’s kisses, so use your favourite. I imagine these would taste great with the caramel kisses (available in the USA) or Rolo’s. I made these for a baby shower and even though there were several other desserts, not a single one of these cookies made it home with me. I’ve tried this recipe using shortening, butter, and a mixture of both. All of these options work well, but I prefer using half shortening for the texture and half butter for the flavour. adapted from Hershey’s. makes about 3 to 4 dozen cookies. This recipe halves well. Preheat the oven to 375°F. Sift together the flour and baking soda in a medium sized bowl and set aside. In a large bowl, beat the butter, lard or shortening, and peanut butter until well blended. Then add both sugars and beat until fluffy. Mix in the egg, milk and vanilla until well combined. Then gently mix in the dry ingredients until just combined. Shape the dough into 1 inch balls and roll in a small bowl of granulated white sugar. 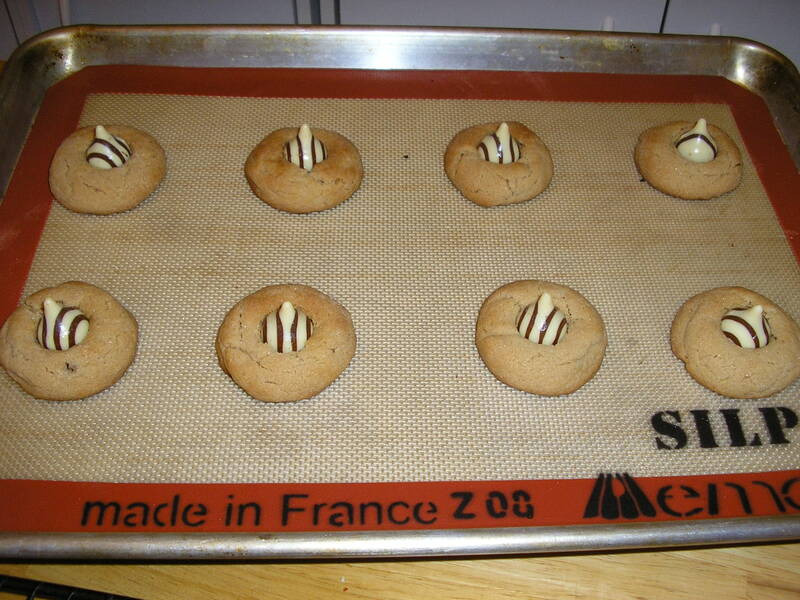 Place the cookies on a silpat (silicone) mat or parchment paper lined cookie sheet about 2 inches apart. Bake until the cookies are lightly browned, about 8 minutes. Meanwhile, remove the chocolates from the wrappers. Once the cookies are done, immediately press a chocolate into the center of each cookie (the cookie will crack around edges). Transfer the cookies to a wire rack to cool completely before serving.